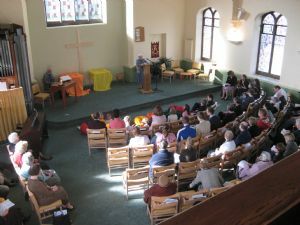 We are a church in the community, situated near the Chelsea Road shops and close to the Royal United Hospital. Our members mostly live in the local area of Newbridge and Weston. We are a church community with approximately 70 members and contacts with several hundred more people through Our worship and Our group activities on and off our premises. IAN our weekly Information and News will tell you what is happening in our church. Weston Methodist Church is part of the North East Somerset and Bath Circuit and Bristol District of the Methodist Church of Great Britain. We are active participants in events and activities that encourage Christian Unity. We therefore engage with More to Life in the Weston and Newbridge areas of Bath, and BathCAN - Bath Christian Action Network.